The purpose of e-VirtualStopsManager EA is management of StopLoss and TakeProfit values on trader's side. The main goal is your broker will not know where are your stops actually located. All orders have individualvirtual hidden StopLoss and hidden TakeProfit stored on the chart. If virtual StopLoss or virtual TakeProfit of an order triggered then the expert will close appropriate order by the market. Slippage option for close command is available on external params. There are Virtual Trailing and Virtual Breakeven features embedded in e-VirtualStopsManager EA. Virtual Trailing makes it possible to move hidden StopLoss by the market permanently on some fixed distance if the market goes to profit side and reached some profit checkpoint. Virtual Breakeven makes it possible to lock StopLoss at some profit level if the market goes to profit side and reached some profit checkpoint. 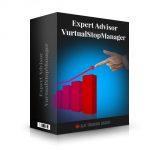 Copy the expert to "MT44\experts\" folder. Attach e-VirtualStopsManager EA to any chart. Allow live trading for EA. Allow import of external experts. You can attach the EA to EURUSD chart, GBPUSD chart, USDJPY chart etc. Every instance of EA will manage individual pair. In this case you should set SymbolsFilter = false. EA will manage only orders with the same symbol as on the chart. You can attach the EA to any chart with any pair one-time. EA will manage all order for all pairs attached to only one chart. In this case you should set SymbolsFilter = true and Symbols = "*". On attachment the expert will add all filtered orders to the chart with calculated Virtual StopLoss and Virtual TakeProfit as graph. labels. You can remove e-VirtualStopsManager EA from the chart. All data will be stored on the chart. You can attach e-VirtualStopsManager EA on the chart again. All stored data will be loaded from the chart to EA memory. You can change an individual Virtual StopLoss or Virtual TakeProfit on the chart manual. In this case e-VirtualStopsManager EA will recognize and process all changes. At first you should modify SpreadsTables by correct pairs and spreads. At second you should set Buy.SpreadAdjustSL, Buy.SpreadAdjustTP, Sell.SpreadAdjustSL and Sell.SpreadAdjustTP options to true if you need it. On the start expert will shows spreads table and spreads difference. Expert will update Adj. SL/ Adj. TP values on the chart once the spread difference per pair will have positive value (widen spread) and if appropriate options (see pont 2) set to true. You still can change left part of Virt. SL and Virt. TP columns to manual adjust SL/TP.